Location: Midway between Los Angeles and San Francisco on the Central Coast this dog friendly home is six miles South of Hearst Castle. Nestled in a forest of Monterey Pines at the foot of the scenic Highway One on Big Sur Coast. Your completely and elegantly furnished home on the Central Coast awaits you with Ocean Views. You can pamper yourself by indulging in a hedonistic vacation. Do nothing more than enjoy the bird songs, watch the waves roll in, spy on the wildlife, stare at millions of stars in a crystal clear sky. Select a book from our in-house library to read in front of the fire place, choose from a selection of CDs, watch a video movie, utilize the fully equipped kitchen, enjoy dinner at any one of Cambria's excellent restaurants or send out for a delicious pizza and dine on either of the two decks while enjoying a spectacular sunset. Local Attractions/Activities: You can actively participate in the many diversions offered in Cambria: hiking, biking, kayaking, surfing, snorkeling, sailing, windsurfing, rafting, antique hunting, nearby golfing and wine tasting at one of the one hundred neighboring wineries. Explore Hearst Castle, visit our famed Elephant Seal colony, tour a plethora of art galleries, dine in a variety of gourmet restaurants, take in local live-theater, attend nightly jazz concerts. Then at the end of a delightful day retire to the soothing sounds of the surf. Cambria is a haven for those seeking a respite from their hectic lives and at the same time provides many enticing activities. This charming two story house has a living room with fireplace. Master bedroom with a queen size Tempur-Pedic® mattress bed and a full bath with Jacuzzi. The second bedroom has a queen bed and an extra long twin bed and full bath, The den has a Queen sized sofa bed with a half bath. If you have an infant, there is a crib available and the infant sleeps in the crib free. Dining room seats eight to twelve to allow you to entertain friends. Fully equipped kitchen and laundry room. Amenities: : Fireplace, phones, Air conditioning, Three Cable TVs, Three VCRs, DVD player Video tapes, DVDs, CDs, books, games, stereo, CD player, Fully equipped kitchen with double ovens, Microwave, Dishwasher, Refrigerator, Ice Maker, Linens, Jetted tub, Garage, Butane Gas Grill (BBQ). Please - No Smoking, Dogs allowed with security deposit. The Big Red House had everything we needed. Loved the view and the gardens. Wow! What a movie collection! It was great to hear the roar of the ocean st night. We would definitely consider coming back again. My husband and I had a very relaxing weekend at the Big Red House. Very quiet and comfortable. The view from the master bedroom and balcony of the sunset was perfect. And the patio and gardens were the perfect place to relax and enjoy a glass of wine or 2. I would definitely recommend this place for an enjoyable weekend away. We did not book this house for long enough. Very conveniently located with great views of the ocean and a very short walk to the beach or town. We will be coming back. The owners were great as well. This property has many wonderful features and one of them is the lovely property owner who makes your stay to her clean, beautifully decorated, comfortable home a magnificent vacation. The ocean view from 2 sides of her home is fantastic and the quiet cul-du-sac has wonderful privacy. The only sounds you hear are the crashing waves of the Pacific. Her collection of DVD movies is most remarkable, literally hundreds of movies! Also, she has everything you could ask for in a vacation home: a fully stocked kitchen, beautiful backyard (we saw deer), use of a garage, washer and dryer, multiple decks to lounge on and the most comfortable beds and linens. We had a very relaxing time in her lovely home. Thank you Elaine. We will be back! It is so rewarding when I hear that my clients are happy with everything the house offers. I truly enjoy doing whatever I can to enhance their stay here. Every visit should be a memorable and positive one for them. 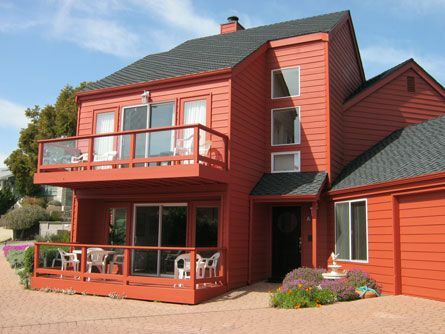 This is a two story stand alone home with large windows overlooking the ocean. Two couples or a family would have plenty of room.